This is the league designed for improvement of the BroodWar player base. Players are split into skill Tiers and matched with high level coaches to participate in a teamleague. From complete newb to avid amateur, experience competitive BroodWar at any level! Sign ups for the season are now closed, but if you are still interested in participating please join the wait-list by joining our discord and sending an admin your information. For current and past broadcasts please check our YouTube. For discussion and coordination please join our Discord. For stats and game history please read our Liquipedia. 1. All matches must be played by Sunday at 20:00 UTC. If you cannot make your game at this time, please arrange to play against your opponent earlier in the week. We have players all over the world, so please try to be flexible with scheduling your matches. Once both players have agreed on a pre-play timeslot, that game time is binding. Failure to show up at the arranged pre-play time will result in a walkover. If you cannot arrange an agreeable time, then the match is considered to begin at 19:00 UTC on Sunday. All players who do not pre-arrange a match, please meet in channel CPL on USWest at 19:00 UTC Sunday. 2. Walkover wins will be granted if an opponent is not available within 15 minutes of the scheduled start time. To avoid a walkover, teams will be allowed to substitute any unused player for a Tier 1 match, and any unused player up to Tier 2 for a Tier 2 match, and any unused Tier 3 player for a Tier 3 match. Substitutes must play the race that was submitted by their team in the line-up. If you are already playing a match for your team you cannot be used as a substitute. Substitutes can be used for matches that are arranged for pre-play if a player no-shows at the arranged time. 3. All matches will be a 1v1 best-of-3 series. Teams must submit 9 players each week to play in a specific match slot from 1-9. They will be matched up against the submitted players from the opposing team and given one week of time before their matches are due. You must specify which race you will be playing that week. If you race pick (e.g. ZvP, ZvT, TvZ) then you must specify your matchups that you will be playing. Random will not be allowed. There will be no option to change matchups between maps in a given week. Note if team participation drops significantly we will likely lower the amount of matches per week to 7. 4. Line-ups must be submitted by 23:00 UTC on Sunday. Team managers must determine who will be available to play before this deadline. 5. Map pool will rotate from the set of 7 maps. The official CPL3 map pack can be downloaded here. 6. The league will run for 10 weeks. Each team will play every other team a total of two times. After the 10 weeks are complete, we will enter a short Playoffs period into a Grand Finals! 7. All results must be submitted with all game replays. 1. Playoffs will run 3 weeks beginning Friday January 25th. The top two teams from the regular season, Not1LegitPlayer and No1CareThat, will have a bye into the 2nd round. Grandfinals winner of week 2 match A and winner of match B. 2. Playoffs will consist of 3 bo1 games in Tier 1, 4 games in Tier 2, 2 games in Tier 3. Same number of players as the regular season but we are switching to bo1 from bo3 in order to make sure everything is casted and played on time. 3. Lineups will be due on Friday 23:00 UTC with casts of the games happening the following weekend. First lineups are due this coming Friday January 18th. Please submit lineups with one player and their chosen race for each map in each tier. Regular season substitution rules apply. 4. Game deadline for playoffs is moved to Friday at 23:00 UTC. Due to the change in schedule we will assume that most players are pre-playing their matches. All players must contact their opponent as soon as possible to work out an acceptable game time. If you do not respond to your opponent by Monday you will be subbed out of the lineup for another player. If your team does not have more eligible players it will be considered a walkover. 5. Replays must be submitted via the team google drive by game deadline on Friday 23:00 UTC. Have you ever wondered how our modern day CPL for StarCraft Remastered came to be? Are you a stats person who is interested in various statistics throughout the different seasons of CPL? Or maybe you're someone who is interested in random tidbits of information or various facts regarding CPL. If any of this sounds like you, I've got you covered! Read on below to find out more. As some of you may know the first season of the modern day CPL was first started by Lmaster. However what you may not know is that this was not the first iteration of the CPL. 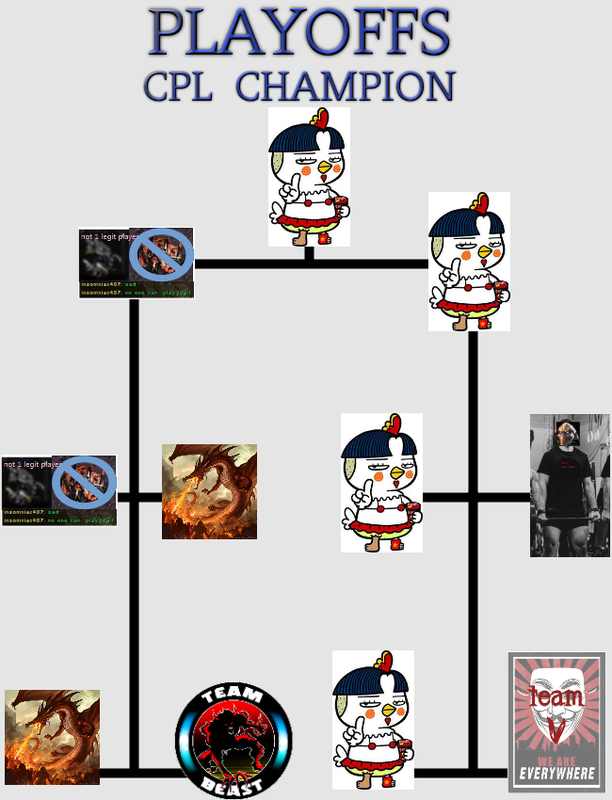 There have been a number of other versions throughout the 20 year history of StarCraft Broodwar for what we call the Coach-Pupil League today. In fact, Lmaster had played in one of these previous versions of a Coach-Student based league. This is where he got the idea to relaunch a league like this in the first place. The sign-ups for CPL1 took place back in November of 2016. Lmaster took all the initiative on this, and it was about the time I (from here on known as Snipe or lazersnipe) was getting back into StarCraft. My good real life friend Alex (DragOn[pain]) told me about this league where good players can coach newer players to play against each other and wanted to know if I wanted to sign-up to play in it with him being my coach. I loved the idea so we both immediately signed ourselves up requesting to be on the others team. Two weeks after sign-ups opened Lmaster hosted a Pre-League tourney for those playing in CPL to get an idea of player skill levels and help organize players for a draft to keep teams even. The tournament spanned over the course of two months with the finals set to take place on January 17 2017. Everyone was having a good time and looking forward to the beginning of the league. At the conclusion of the tournament however, our good friend Lmaster had started to get busy with real life commitments, real busy. Week by week went by without hearing much about what was happening with CPL, when was the draft? Was it still happening? What happened next? People started losing interest, people were dropping out, and it looked like the league wasn't going to happen after all. Being a big supporter of the idea of the league, and not wanting to see it die, I went through all the sign-ups and tournament results and compiled a list of the players we had, organizing them into separate tiers accordingly. I brought this list to Jealous (a guy who was helping Lmaster out in terms of casting the tournament games and pitching ideas for the league) and told him about my idea to get the players drafted. Jealous supported this, and so I released this list to the Season 1 coaches and explained what we were doing. My hope here was that I would get the teams created, allowing Lmaster more time to get back and run the league before losing all interest. The draft had been completed and the teams were formed, but it still wasn't looking great for the league. Lmaster remained busy and we had no format, no idea what we were going to do for the league. More time went by and it became apparent Lmaster wouldn't be back/able to run the league. Realizing this, (and sticking with Lmaster's plan) I set up a 2 month practice period for teams. During this time you got to meet with your team and learn/practice together before the league started. Again, I was still holding onto the hope that Lmaster would be back to run his league. He wasn't coming back to do it though, it had eventually became clear what had happened, I had inherited the league. From that point on I, along with the help of Jealous, started planning and designing the league. We came up with the idea of doing best of 3s, first map pre-determined each week, with a loser pick format for games 2 and 3. I had no idea how the community would accept or react to this, but I wanted this league to happen. After a lot of planning, I drafted up a rule-set, created some graphics to promote the league and made the post on Team Liquid CPL SEASON 1 was back, and started April 30 2017. From the outside looking in we had a decently run league for lower leveled players to learn the game and improve. A great premise that produced some fun games to watch, a new little community of players, new friendships and a chance to be in the spotlight. A lot of players were enjoying the league and having fun with it, but it wasn't all sunshine and rainbows, at least not on the administrative end. It was a lot of work for two people, too much. Jealous did so much for the league, he created and maintained everything on the liquipedia, did at least 1 cast per week, actively reaching out for guest casters, new players to replace inactive ones, talking to coaches, creating interviews, the man was a total workhorse for the league and I couldn't have done it without him. Big shout out to Jealous for that. Both Jealous and I had some real life issues at the time and wanted to back out at some point. As Jealous once put it “We were overworked and under paid”. Being just the 2 of us, we felt more accountable to the other, and didn't want to let each other down. We stuck it out until the end, ran a successful league and even had a few events afterwards. Lmaster had come back partway through the league and started marathoning casts. With his help we managed to do what we previously thought impossible - cast every game played in CPL 1. Overall I would say season 1 was a success. There was definitely a learning curve and a lot of stressful moments, but Jealous and I made it to the end. The Grand Finals of Season 1 took place on July 30 2017. The season was concluded and wrapped up on August 6 2017, with an All-Star Team Battle event. At the conclusion of the league some people enjoyed it so much they wanted more. “When is season 2?” “Are you guys going to do this again?” “Are there going to be more CPL events?” At the time neither Jealous or I were in any hurry to go through all that work again, especially with SCR slated to come out later that month (the entire 1st season was played on ICCup). We wanted time to see how the new “MMR ratings” would work in terms of player skill and how it would effect the community. With season 1 completed and a post on Team Liquid by Jealous containing a lot of closing words from both of us, CPL was left in limbo.. That was until..
Our CPL season 1 team stuck together in our own Discord group. We became pretty good friends, chatting about BW, and many other things. We all kept up with both the Korean and foreign broodwar scenes. One day we were chatting about the StarCraft community as a whole, when my fellow season 1 team mate, good friend, and now CPL Administrator PiSan mentioned he wanted to give back to the community and bring back CPL for a second season. By this point SCR had been out for awhile and we had a better understanding of different MMR ratings. When PiSan mentioned a season 2 everyone in our Discord was behind him, with fellow team members Awerti, and myself, joining in to help him for season 2 as Administrators as well. PiSan attributed a lot of his desire to move forward with CPL and continue it for Season 2 to his Season 1 coach DragOn. His experience with DragOn kept him going throughout the first season and beyond. DragOn put in a lot of work with his students and because of this PiSan not only learned a lot from him about the game, but he also wanted to do something more for StarCraft. A second season of CPL was his way of giving back to the community. After some discussion and planning season 2 was well on its way. PiSan created a write-up and made a post on Team Liquid for sign-ups on March 21 2018. With the release of StarCraft Remastered bringing new life into the game, we saw even more response to this than we did in season 1. While we still had a total of 5 teams in both seasons, we made a few format changes moving forward, including increasing the number of games from 5 to 7 best of 3 matches per team per week, choosing all 3 maps to be played each week, and creating 2 tiers of players. This worked out pretty well, though we did have some imbalances in some games. We had a lot more games coming in, but a lot less stress all around as we had more help. With many more casters aside from ourselves we were able to get all the games casted, as well as creating and uploading them all to the CPL YouTube with the help of Connor5620. With PiSan creating the league, formatting, and running it, Awerti taking care of all the stats and everything Liquipedia, and myself handling weekly organization of replays and match-ups, things ran a lot smoother than season 1. When PiSan stepped up and brought back season 2 he had more in mind than what we had already created within our community. He would be the first to tell you that our goal with CPL wasn't just to have this low level league where people who still love Broodwar can come compete and see themselves casted against other low level players in a team league format. His goal for CPL was for it to become a place where people new to StarCraft could get involved. Where someone could get a first look into the competitive scene, a place to come to learn anywhere from the basics, all the way up to improving to become one of the next great foreigners. A place for all skill levels to learn, and improve together in this great game. I was fully on board with this and continued to be as we moved through the second season. PiSan had set season 2 to officially begin April 15 2018. Which, much like season 1 ran for a total of 10 weeks of regular season play with playoffs to follow. Season 2 was wrapped up with the Grand Finals being cast live by both PiSan and myself on July 15 2018. We may have had a few less events during the second season, but overall I would say it was a bigger success and saw more people getting involved and helping out in our community. I know moving forward PiSan is looking to do more events, and have more emphasis on learning the game outside of just the team environments in CPL. I look forward to working with him on some of that, and I hope the community will get use out of what is planned for the future of the CPL community as a whole. With season 2 wrapped up we look forward to the next season, and improving things even more. The hope is that season 3 will be even bigger and better than season 2, with more events, and more tools for learning the game. At the time of this writing the CPL community has grown a lot since the end of season 2 and has even more players participating in the league. I'm glad to be a part of this as StarCraft as a whole continues into the future; I hope the reader is too. As for what comes next and the history of CPL season 3, we'll just have to wait and see, as that, is still being written. The max rank to play in the league was high C- or low level C players. Despite being labeled as one of the 2 lower ranked teams at the start of the season, Drag 'n Herb finished 1st in league play and was eventually crowned the league champs! They finished the league having 5 of their players ranked top 10 in the league. There were 59 players that originally signed up for the league. These numbers above are somewhat inaccurate however. The league took awhile to get started up so we lost a good number of original sign-ups and gained some others. When the draft completed there were a total of 54 players drafted onto teams. This number however is also misleading as again, due to such a long time delay many of these players dropped out or were never heard from again/didn't play any games. The final count of players that recorded AT LEAST 2 wins during the duration of the league is: 28 players. There were a total of 14 Coaches involved throughout CPL 1. However it should be noted some of these coaches joined to help out mid-season and some were considered "assistant coaches", some of whom joined future CPL seasons as players. The above graphs show the number of WINS by each race against the opposing race and the number of mirrors throughout league matches only (All-star match wasn't included). It should also be noted these stats DO NOT include matches where a random player was involved, or if any player received a walkover. Match-ups involving race-pickers were included. All league matches were best-of-3 with all 3 maps being chosen each week. Despite finishing 2nd place at the end of the regular season, Team Beast was eventually crowned the league champs! Team Supply Block was the only team other than Chobos With Attitude to win more games than lose though they still finished in last. This is because they were involved in and lost a lot more 2-1's than any other team. There were 98 players that originally signed up for the league. These numbers are only indicative of the initial sign-ups. More players were added/dropped out of the league as the season went on. There were a total of 76 players that recorded at least 1 series played throughout the season. There were a total of 14 Coaches involved throughout CPL 2. However it should be noted some of these coaches joined to help out mid-season and some were inactive/dropped out. The above image shows the total number of games played on each map, including the win rate for each MU and number of mirrors played. Interestingly enough the map distribution was equal across all 10 weeks, but because of how the 2-1's went, Total game count for Fighting Spirit was played most, and Tau Cross the least. Ah we have a thread! I think we have a winner already. Samyang Fire boys are cheap, hot, spicy and on fire! Nothing can stop them! FYI I saw your post in the previous thread. If discord plays nice for audio I don't see any reason we couldn't do some casting together. Let's get it. The throwback. Hmm perhaps a Wednesday cast? That would work for me. LMK. Week 2 results have been updated and week 3 match-ups are now live! Week 3 results have been updated and week 4 match-ups are now live!